Up to now, we have only considered magnetic reconnection that develops spontaneously from a plasma instability. As we have seen, such reconnection takes place at a fairly leisurely pace. Let us now consider so-called forced magnetic reconnection, in which the reconnection takes place as a consequence of an externally imposed flow, or magnetic perturbation, rather than occurring spontaneously. The principal difference between forced and spontaneous reconnection is the development of extremely large, positive values in the former case. Generally speaking, we expect to be for spontaneous reconnection. By analogy with the previous analysis, we would expect forced reconnection to proceed faster than spontaneous reconnection (because the reconnection rate increases with increasing ). The question is--how much faster? To be more exact, if we take the limit , which corresponds to the limit of extreme forced reconnection, how fast can we make the magnetic field reconnect? At present, this is a controversial question that is far from being completely resolved. In the following, we shall content ourselves with a discussion of the two ``classical'' fast reconnection models. These models form the starting point of virtually all recent research on this subject (Yamada, Kulsrud, and Ji 2010). Let us start off by considering the Sweet-Parker model, which was first proposed by Sweet (Sweet 1958) and Parker (Parker 1957). The main features of the envisioned magnetic and plasma flow fields are illustrated in Figure 7.9. The system is two-dimensional and steady-state (i.e., and ). The reconnecting magnetic fields are anti-parallel, and of equal strength, . We imagine that these fields are being forcibly pushed together via the action of some external agency. We expect a strong current sheet to form at the boundary between the two fields, where the direction of suddenly changes. This current sheet is assumed to be of thickness and length . Figure 7.9: The Sweet-Parker magnetic reconnection scenario. Here, we have balanced the magnetic pressure at the center of the layer against the dynamic pressure of the outflowing plasma at the ends of the layer. Note that and are the plasma resistivity and density, respectively. We conclude that the reconnecting layer is extremely narrow, assuming that the Lundquist number of the plasma is very large. The magnetic reconnection takes place on the hybrid timescale , where is the Alfvén transit timescale across the plasma, and is the resistive diffusion timescale across the plasma. The Sweet-Parker reconnection ansatz is undoubtedly correct. It has been simulated numerically many times, and was confirmed experimentally in the Magnetic Reconnection Experiment (MRX) operated by Princeton Plasma Physics Laboratory (PPPL) (Ji, Yamada, Hsu, and Kulsrud 1998). The problem is that Sweet-Parker reconnection takes place far too slowly to account for many reconnection processes that are thought to take place in the solar system. For instance, in solar flares , , and (Priest 1984). According to the Sweet-Parker model, magnetic energy is released to the plasma via reconnection on a typical timescale of a few tens of days. In reality, the energy is released in a few minutes to an hour (Priest 1984). Clearly, we can only hope to account for solar flares using a reconnection mechanism that operates far more rapidly than the Sweet-Parker mechanism. where we have assumed incompressible flow, and an outflow speed of order the Alfvén speed, as before. 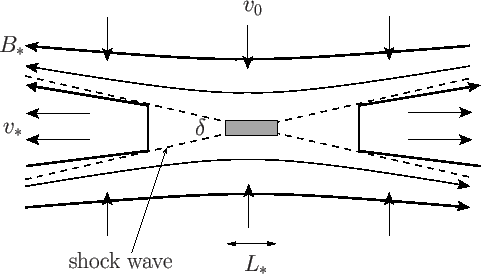 Thus, if the inflow speed, , is much less than then the length of the reconnecting layer is much larger than its width, as assumed by Sweet and Parker. On the other hand, if we allow the inflow velocity to approach the Alfvén velocity then the layer shrinks in length, so that becomes comparable with . Figure 7.10: The Petschek magnetic reconnection scenario. Thus, for small inflow speeds, the outflow is confined to a narrow wedge along the interface, but as the inflow speed increases, the angle of the outflow wedges increases to accommodate the increased flow. can be regarded as specifying the maximum allowable rate of magnetic reconnection according to the Petschek model. Clearly, because the maximum reconnection rate depends inversely on the logarithm of the Lundquist number, rather than its square root, it is much larger than that predicted by the Sweet-Parker model. It must be pointed out that the Petschek model is controversial. Many researchers think that it is incorrect, and that the maximum rate of magnetic reconnection allowed by resistive-MHD is that predicted by the Sweet-Parker model. In particular, Biskamp wrote an influential, and widely quoted, paper reporting the results of a numerical experiment that appeared to disprove the Petschek model (Biskamp 1986). When the plasma inflow exceeded that allowed by the Sweet-Parker model, there was no acceleration of the reconnection rate. Instead, magnetic flux ``piled up'' in front of the reconnecting layer, and the rate of reconnection never deviated significantly from that predicted by the Sweet-Parker model. Priest and Forbes later argued that Biskamp imposed boundary conditions in his numerical experiment, which precluded Petschek reconnection (Priest and Forbes 1992). Probably the most powerful argument against the validity of the Petschek model is the fact that, more than 50 years after it was first proposed, nobody has ever managed to simulate Petschek reconnection numerically (except by artificially increasing the resistivity in the reconnecting region--which is not a legitimate approach) (Yamada, Kulsrud, and Ji 2010).